I've been having a bit of an equine moment on my blog this week but I'm interrupting this broadcast for a very special lady... step forward the lovely Darnell! 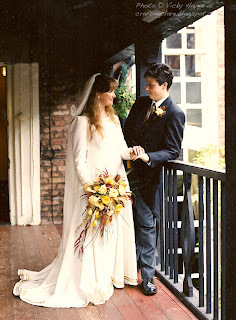 It's Darnell's wedding anniversary today and I wanted to wish her a very happy one along with some of her other friends here in Blogland. For my heart plants I've used some a stamp that isn't even available yet (yes, Darnell, you get a sneaky peek at one of the upcoming Sale-a-bration stamps!) I've stamped several of this gorgeous leaf image on top of each other to represent a plant of lurve that has grown strong and healthy! • There's only one place left for my Stampers 6 club starting in February. Do let me know as soon as possible if you'd like to join in - you'll get a free spring/summer catalogue, the opportunity to earn Sale-a-bration freebies as well as getting at least £25 of free items from the catalogue - all for placing an order of £25 or more each month for six months! I'm looking forward to seeing Darnell's wedding anniversary post today - she has said she'll be posting a wedding photo of herself and Mister. So, to join in with the fun, we're all posting a photo of our wedding day (in fact this one's been on my blog before but is the only one I can lay my hands on at the moment...) My husband and I look terribly romantic but I'm sure we're wondering where the loos are, or giggling about something rude great aunt Mabel said quite audibly during the ceremony. Actually I'm making that bit up - I don't have a great aunt Mabel to my knowledge and if I did I'm pretty sure she would be sadly well-behaved! • If you'd like to join in with Darnell's surprise party, we're all getting together at Ardyth's linky! Normal service will resume here tomorrow when I'll be back with a quick card for Three Minute Thursday. See you then! Wonderful card Vicky, your heart is kind and caring. You are a lovely lady! This is a perfect sentiment! And a perfect card and post. What a lovely wedding picture! Beautiful card for a wonderful couple! What a lovely picture from your wedding, too! Lovely card today, for the special occasion. sorry not to have been in touch but family issues are massive, have kept up to date withh all you do on your blog, but finding time difficult to comment ! Sorry limp excuse!!!! LOL Lovely wedding photo too. What a beautiful card! I adore the sentiments and the pretty flowers. I think your and your Mister just look fab in this photo - so much in love! I'm enjoying this blog hop! Thanks for joining in all the fun, Vicky! That is definitely a perfect sentiment for Darnell, and I love the use of the leaf/plant stamp at different heights (and different adornments) to represent Darnell and Mister. You would have to make one taller and one shorter for me and my Mister - and yes we did have Scottish dancing - Eightsome Reels and Gay Gordons (and a few others whose names escape me) - I had never done it before and haven't done it since, but it was fun that one time! What a great card and a lovley sentiment. Lovely card, Vicky, and a very sweet gesture and tribute to your pal. A perfect card, with a perfect sentiment. Thank you so much, Vicky! What a wonderful surprise this has been! Mister and I are both quite overwhelmed. You've made me feel so loved and special with a dedicated post just for me! I'm totally blushing and laughing and crying. Phew, my heart! I ADORE your card with the Mr. and Mrs. Stems and flowers! Adorable! I'm pinning all our beautiful anniversary cards on a special board on my Pinterest account. Thank you for linking to Ardyth's post, but do you think you could do another link with your photo, or instead of your card? We so loved the idea of seeing all the photos in the thumbnails and your photo is absolutely stunning! Please? Your wedding photo is absolutely dreamy! Love how romantic it is! Love your wedding photo, such a beautiful candid shot.